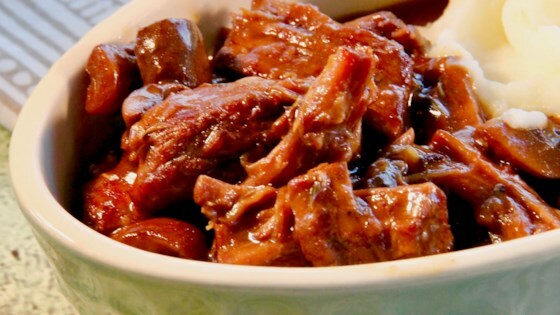 "A great way to make a tough cut of beef flank tender and flavorful using an Instant Pot®. Serve it over crusty buns or mashed potatoes; either way, enjoy!" Turn on a multi-functional pressure cooker (such as Instant Pot(R)) and select Saute function. Saute steak, working in batches, until brown, 3 to 5 minutes per side. Set aside on a plate. Heat avocado oil in the pot. Saute mushrooms and onion until onion is translucent, about 5 minutes. Add garlic and thyme; saute until fragrant, about 1 minute. Pour in wine; cook and stir until almost evaporated, about 2 minutes. Add broth, Worcestershire sauce, salt, and pepper. Bring to a simmer. Add the beef to the broth mixture and turn to coat. Select the Meat option according to manufacturer's instructions. Close and lock the lid; set timer for 20 minutes. Allow 10 to 15 minutes for pressure to build. Release pressure using the natural-release method according to manufacturer's instructions, at least 20 minutes. Remove the beef and set aside. Stir water and flour together to make a slurry. Select the Saute option and add the slurry slowly. Cook until liquid thickens, 3 to 5 minutes. Pull the beef apart using 2 forks. Stir beef back into the liquid. Watch Chef John butterfly, stuff, roll, and braise delicious flank steak. Any tough, lean cut of beef will work. Substitute olive oil for the avocado oil if desired.